Another deal, there's no catch whatsoever when you write to get paid. It works like this, you sign up with a network and they share with you revenue generated by articles you write. You also can write articles for specific companies, these one are called paid reviews and can go from $1.5 per article up to $20 per single article/review, how you like to call it, it's same thing at the end. This is a FREE to join network where you can write articles (they call them lenses) and after yo publish your articles traffic/visitors comes, over there are placed sponsored ads, people interested in ads are going to click them, in that moment you get paid, keep in mind your earnings are split with Squidoo. The reason I don't like that and always recommend to my readers interested in this to create their own website to make money online. Okay, this would be the short description for this network. Now if you like to register at Squidoo you may click here. This works like the above network, however they call an article a hub, so you must write and publish hubs to any topic you like, article in general exceed 500 words. In 500 words you can easily tell a story, write a review to a specifc product, say your personal opinion and whatever you like. Money comes from Adsense, some affiliated programs like Ebay and Amazon. Once you earn $100 on Adsense and $50 from those affiliated programs you receive your money via Paypal. Enough with this network, now if you like to join this program you may click here. You have heard of this network, if you don't it seems you live in a rock or something. Joking...! When you join here you can offer your article writing skills to the price of $5, from this 5 bucks you get $4 in your hands, as you can guess $1 goes to managers of Fiverr. My opinion about this fact is obviously a good one, sound fair to me. 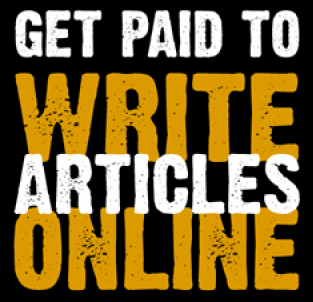 And let me tell you why, because of this network is very known you get your serviced fast noticed by those people interested in buying articles, and believe me a lot of people is looking for great writers. Okay this would be all. Now if you like to register this network you may click here.